A Narrow Escape: We only did it!! So in a nutshell, she is a 54ft Semi Trad, built in 1996 by Jonathan Wilson Boats, we think absolutely stunning inside lined in oak. What attracted us first were the portholes, with five side hatches and glass sliders, so we can have plenty of light and air or cosy and private. 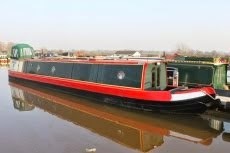 At the moment she is having some work done as called by the surveyor and also being blacked whilst out of the water, so she is sitting in Venetian Marina on the Shropshire Union with the nice people we purchased her from. We hope to hand over next weekend and spend the first week getting used to her before our first trip down to King's Bromley Marina, on the Trent and Mersey, where we have secured a mooring in a really lovely setting. Fantastic! You will never again have extra cash there will never be a day without a to do list but you will have tons of fun and wonderful adventures. Warmest congratulations. Haha Thanks very much guys, looking for competent crew, do you know any? So in that sense we are somewhat related ��Sadly we sold Bunbury on, after two lovely years of cruising. We loved her and miss her but it was the right thing to do as we had other commitments that stopped us from spending on board. Will buy another boat later though, let's hope she is as nice as Bunbury! It's lovely to hear that Bunbury is still being loved. I built her and somewhere I still have the original pencil design drawings on A2 sheets. We met Jonathan at Kilnhurst South Yorkshire, he was just starting to build boats on his own instead of working for others. The site was a car scrapyard and wide open to the elements. Bunbury was the first boat built by the Jonathan Wilson boat building company and we had many arguments about the design. We were going to call the boat Nightmare because every time I asked for extra things like recessed panels he would say that they were a nightmare. He couldn't understand why we wanted semi trad but a traditional engine room. At that time we had two young children and keeping them in the semi trad bit was safer. We were even featured on a company calendar coming down the Calder and Hebble. I hope the Roses and Castles are still okay, they were painted by my brother and I asked him to include pit headgear on one of the panels because we originate from Barnsley. He was a brilliant artist but unfortunately passed away at the age of 54. Somewhere on the internet is an explanation of how to safely leave and enter Selby lock onto the tidal Ouse and the pictures feature us and Bunbury on a very high tide. We still have quite a few pictures of Bunbury and still have a place in our hearts for her.